Sweep your floor with a soft-bristle broom to collect dust and particles. This should be done often, if not daily. Use the soft brush attachment on your vacuum to clean the perimeter, getting in those hard-to-reach parts. You should also vacuum around furniture legs. 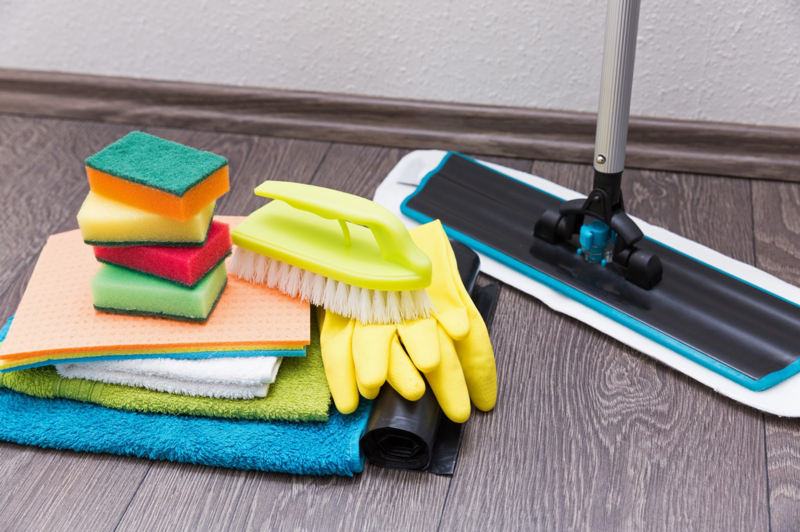 Spray your laminate with a cleaner (preferably the one recommended by your flooring manufacturer) and mop with a microfiber pad. Put floor protectors underneath any items of furniture to prevent unnecessary scrapes. Place doormats at entrances to trap grit and outdoor particles on shoes. This reduces the chances of unwanted dirt settling on your laminate. If possible, remove all shoes before stepping onto laminate, especially high heels and stilettos – they can easily dent or take chunks out of planks. Keep pet nails trimmed and tidy for the same reasons. Protect your floor from excess sun exposure as this can discolour the planks. As some fade is normal, move furniture around occasionally to help the floor age evenly. Consider putting mats or rugs down in high footfall areas to reduce wear on the planks. This can be below kitchen sinks, cabinets, cookers and dressing tables. Clean up spills immediately to prevent moisture from seeping into the boards. For chewing gum removal, use an ice cube to freeze it and then carefully scrape it off the laminate with a plastic knife (or bank card). Similarly, with candle wax, allow to harden and then scrape off gently without scratching the surface. For tough stains like oil, paint or ink, use a small amount of acetone-based nail varnish remover and lightly dab at the infected area. Alternatively, a cloth with rubbing alcohol on should also do the trick. Just remember to wipe any residue away with a slightly damp cloth. If a plank is damaged beyond repair, you don’t have to worry about replacing your whole floor. A quick process allows you to remove and replace the plank easily.